To request a SnakeGrid parameter file for use on your project, please get in touch with us with details of the project for which you require a SnakeGrid parameter file. This could be a verbal description (e.g. “rail route from A to B”) or it might be accompanied by a simple map. Include in this any particular requests that you have for the characteristics of the grid. For example, if you want it to match with an existing grid at any particular point (generally only one is possible) or if it has different branches that you would like to include on one single grid. 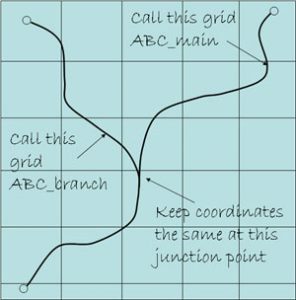 We can normally accommodate branches a few kilometres apart on the same seamless coordinate system. 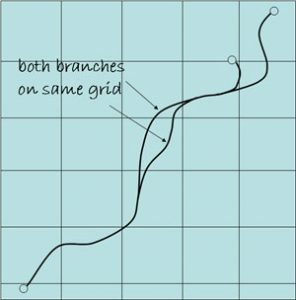 However, where different branches diverge more substantially we can create a separate grid that is continuous at an indicated junction point. Within a few kilometres of this junction point the two grids will be identical to within a few millimetres, thus enabling continuous surveys across the join. We generally aim to keep the scale factor distortion less than 20 parts per million (ppm) on the track or road, which is compatible with surveys at 1:50,000 accuracy. If your requirements are different to this, then let us know. At this stage we shall be in a position to indicate the one-off price for the design of the grid.